Bang & Olufsen has revealed its newest flagship TV, the BeoVision Avant, and joined the ever-growing UHD crowd with aplomb. Bang & Olufsen has embraced Ultra High Definition (UHD) with its latest flagship television and, as is typical of the Danish company, it's done it with no short amount of style. Mounted atop a motorised steel floor stand, the 55-inch BeoVision Avant is a luxurious blend of aluminium, glass and plastic. Movement is a key theme with the new flat screen; turn it on and the speakers silently glide down from the base of the screen. Along with the circular floor stand, B&O also offer motorised wall brackets and a motorised table stand. In each case, the Avant can be pre-programmed with up to three different physical positions assigned to three buttons on the accompanying remote control. When it's up and running, the Avant uses a 180-degree ambient light sensor mounted on top of the TV to run an algorithm that B&O calls "Chromatic Room Adaption" that, in effect, keeps the picture quality and colour contrast consistently optimised. The LED panel itself boasts a 3840 x 2160 pixel resolution for UHD content and five of the six HDMI inputs are UHD compatible. The glass itself has been given an anti-reflective coating that, B&O says, will dampen reflections on the screen by 98 per cent. Anyone familiar with the brand won't be surprised that sound hasn't been left out of the equation. The integrated three-channel speaker houses eight fully-active speakers, each with a dedicated class D amplifier. What's more, the Avant houses an integrated wireless transmitter that will connect up to other B&O speakers you might happen to have set up for a full 7.1 surround sound option. Internet services, like YouTube or Spotify have been included and incorporated into the Avant's Scandinavian-style UI. You can access all the services through the aluminium BeoRemote One and B&O has said it will keep the Avant updated with future services through software updates pushed out in the future. Similarly, any set-top boxes or games consoles can also be accessed through the on-screen UI. “People are pressed for time, and they want entertainment that just works so they can focus on it – and each other – rather than the technology itself," said Bang & Olufsen's CEO Tue Mantoni. "We believe the new BeoVision Avant will set the standard for what should be expected from a television in the future”. If you want to get a hold of that standard, you'd best be prepared to pay for it, as the Avant comes in at £5,995 for the 55-inch model and that's without any of the motorised stands included. 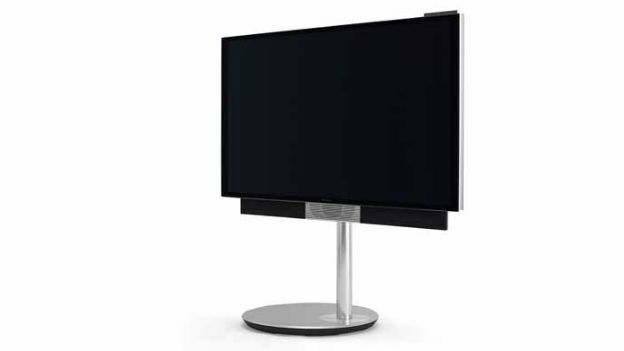 Given B&O's usual pricing - the B&O BeoVision 11 launched last year for £5k without 4K - it's to be expected, but isn't as drastically expensive as it could have been. And, if you fancy getting hold of the Avant for yourself, you won't have to wait. It's available to buy from suppliers, and the B&O website from today.